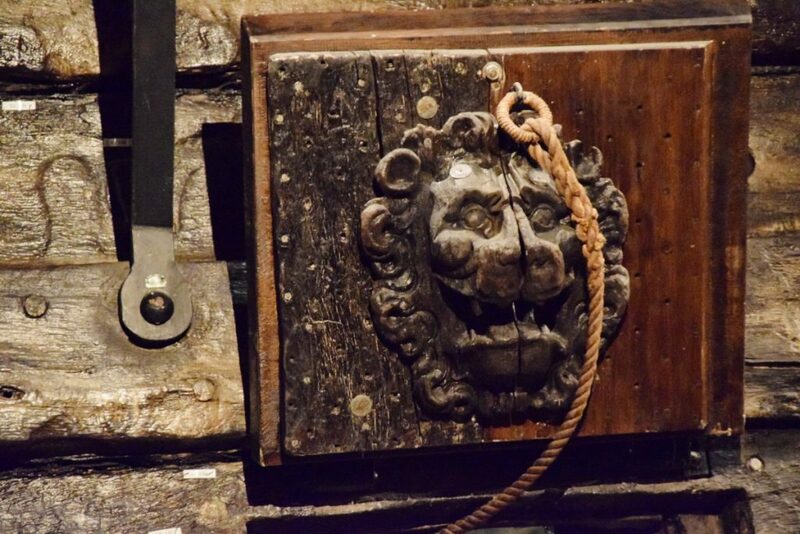 This is the story of a ship called the Vasa – the biggest, baddest and crappiest warship to ever set sail in the northern seas. I don’t think it’s going to spoil the story much to say it sank. View of the outside (at 3.20pm), Vasa Museum, Stockholm, Sweden. 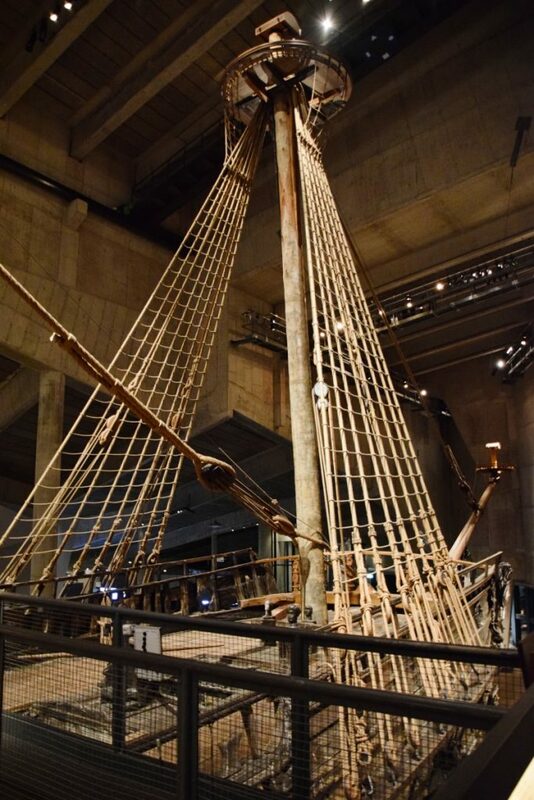 By the way, those masts demonstrate how high the Vasa would have stood. 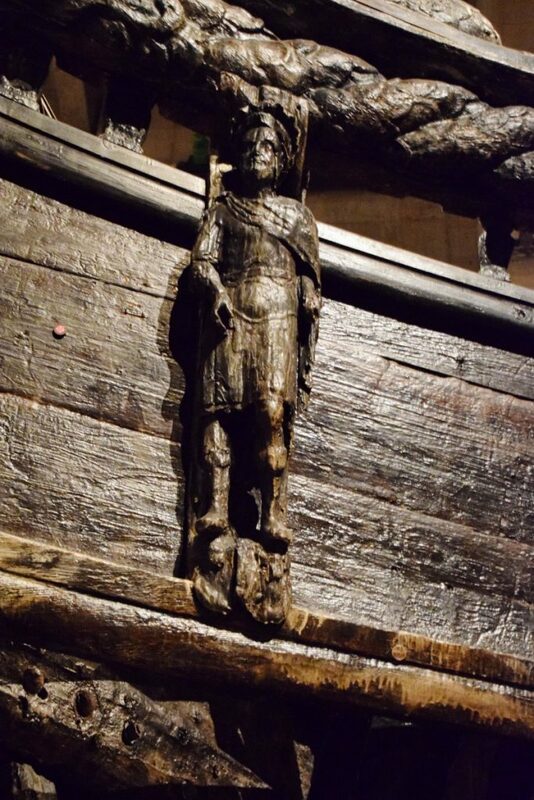 But, as they say, one man’s loss is another man’s gain, and after lying in the sea for 333 years, the 17th century warship was lifted out the water. 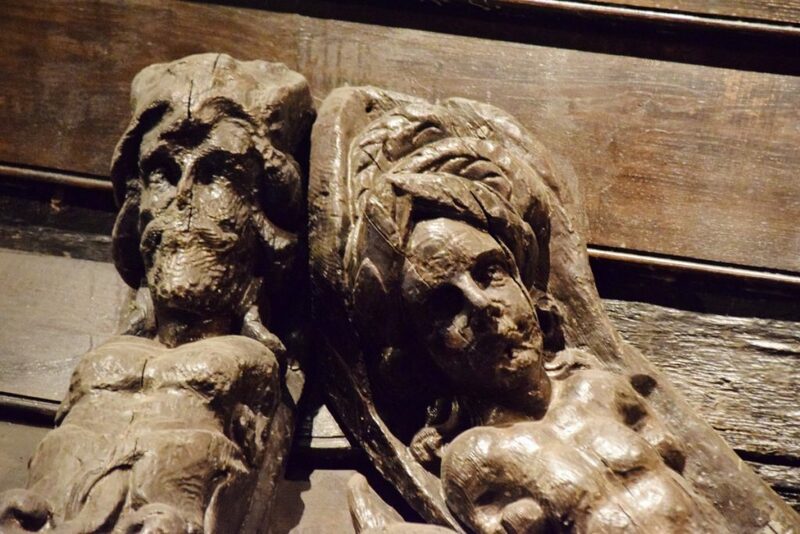 Of what you see, about 95% of the wood is original, which is really quite extraordinary. The ship has provided a wealth of information about ships and life on board, and the museum which houses this impressive structure shares much of this information with us. It really is an amazing experience especially if, like me, you love old ships, and even though you aren’t allowed on board, you get to walk right round it on a few levels, so end up by getting quite close. 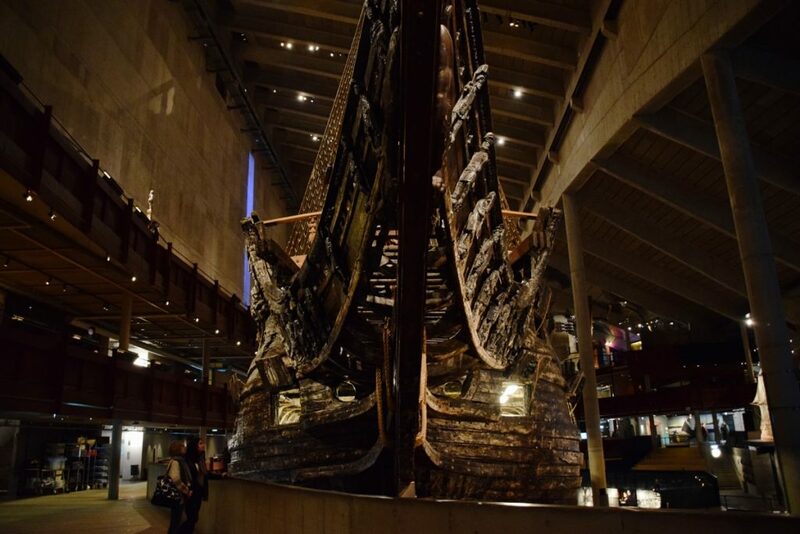 The Vasa is an amazing structure and it has a fascinating history, which is unusually well covered by the history section of the museum’s website. Therefore, I will just give a brief (though still quite long) overview, based on their write up – if you’d like more detail, I do recommend you check out the pages on the website, particularly if you want to know more about the nature of navy warfare or the technicalities of the raising of the Vasa. Also a quick disclaimer – I love ships, but am a total landlubber. I’ve tried my best to accurately describe the ship in nautical terms, but please excuse any mistakes! 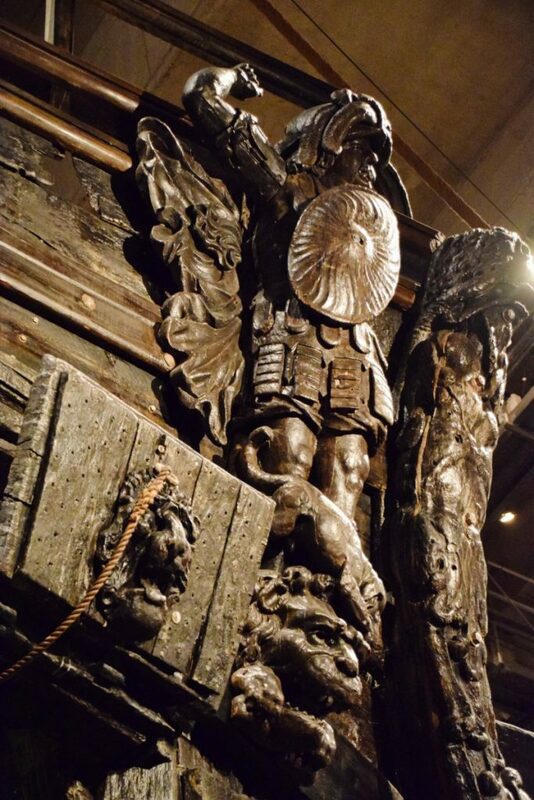 The story of the Vasa is, like so many disasters, a reflection of the preoccupations of its time. Gustav II Adolf, the grandson of Gustav I (usually referred to as Gustav Vasa) became King of Sweden in 1611 and inherited three wars – he was therefore understandably concerned with strengthening his country’s military and navy. After 1618, he reformed the policy of building new ships haphazardly around Sweden (near the forests whose wood they used) and saw the benefit of having centres of production. The most important of these shipyards was in Skeppsgården in Stockholm. Skeppsgården was on a rocky island, reached by a guarded wooden bridge. There were offices, warehouses and workshops in the complex, but the largest building was a five forge smithy, whose bellows were worked by shackled prisoners. Everything that was needed for the construction of the ships was made on site, with over 300 people working in the warmer months. Most of those employed throughout the year were Swedes and Finns, with some immigrants from Denmark and Baltic countries. The seasonal workers came mostly from Holland and Germany – who were paid double that of that of the locals. Interestingly, the navy yard was operated by private entrepreneurs under contract to the crown – in the 1626, the contract went to the Dutch master shipwright Henrik Hybertsson and the merchant Arendt de Groote. They were paid to repair and maintain the navy’s ships and build new ones, but it was up to the pair to source the necessary raw materials, recruit craftsmen and ultimately produce ships that were a credit to the Swedish navy. And the raw materials came from all over Europe – the wood came from Sweden, but sometimes they went as far as Riga or Amsterdam for planks. The tar came from Sweden and Finland, the hemp from Latvia, coal from England, sailcloth from Holland and France. This was why it was helpful having a merchant in the partnership, because de Groote would constantly be sailing around sourcing the necessary commodities. 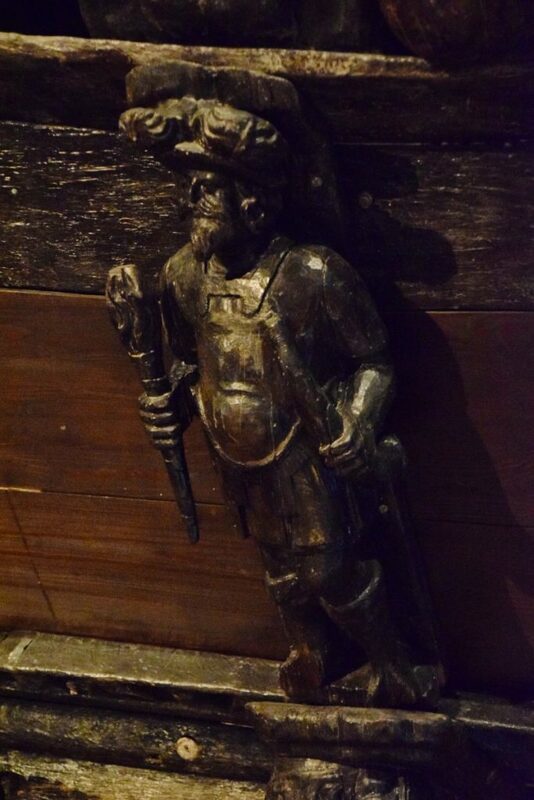 In order to get the best of the best in terms of craftsmen, there was an emphasis of recruiting people from around Europe who came from cultures with already established traditions of manufacture – for example, the master gunfounder who cast the cannon for the Vasa was Swiss, the chap in charge of the rigging maintenance was Scottish and the vast majority of permanent masters in the specialised navy yard shops were Dutch. And they were supervised by a Dane. Henrik Hybertsson designed the Vasa. He had a good reputation and had already successfully built warships for the Swedish navy. 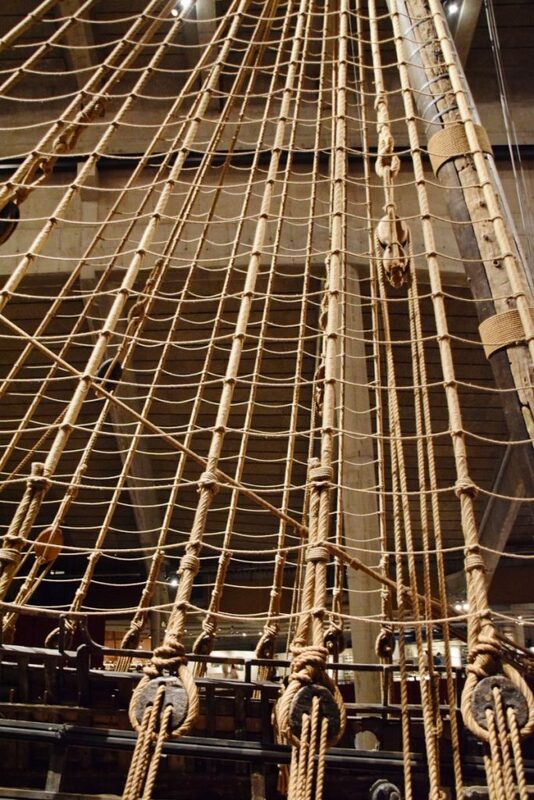 The way the ships were built in this period, though, was a bit haphazard, in that they didn’t have the mathematic principles of shipwrights of a hundred years later, which were used to predict the stability and speed of a ship. 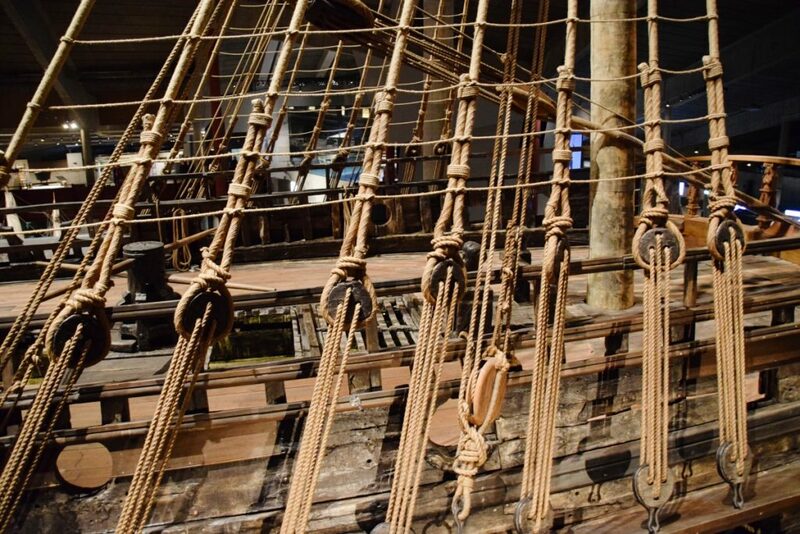 The ships were built according to the principles of experience and therefore when a new set of demands came – in the Vasa’s case with regard to its being of a larger size than usual and carrying more cannons – the construction became something of a guessing game. 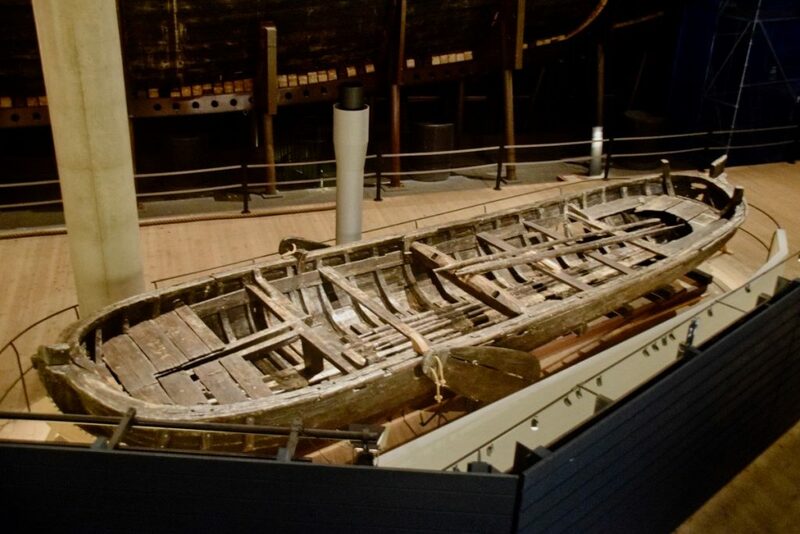 The policy was that any potential problems would be ironed out once the ship sailed – such ships were known to be ‘crank’, that is, they heeled abnormally and recovered slowly in reaction to wind. 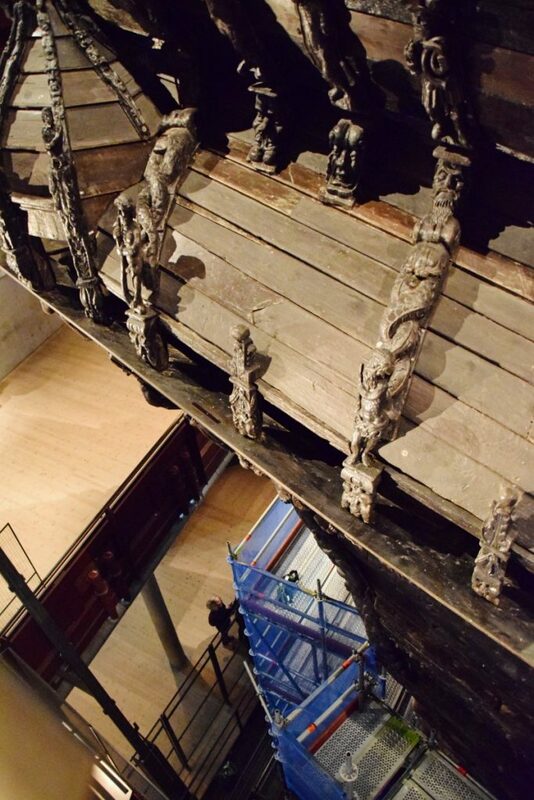 It was therefore expected that large ships like the Vasa would have to be adapted, and there were various techniques to solve problems – from adding extra planking to the waterline to having decks removed. 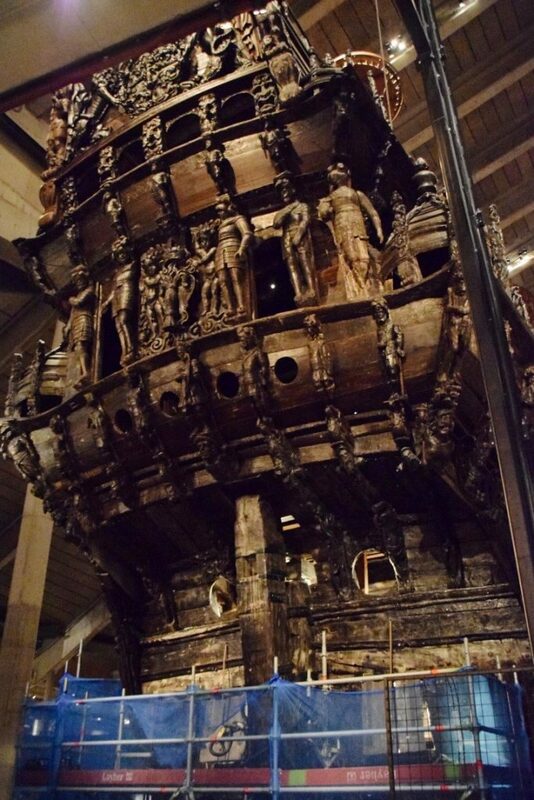 The problem was, the Vasa was so darn crank that it didn’t even survive long enough to be fixed. 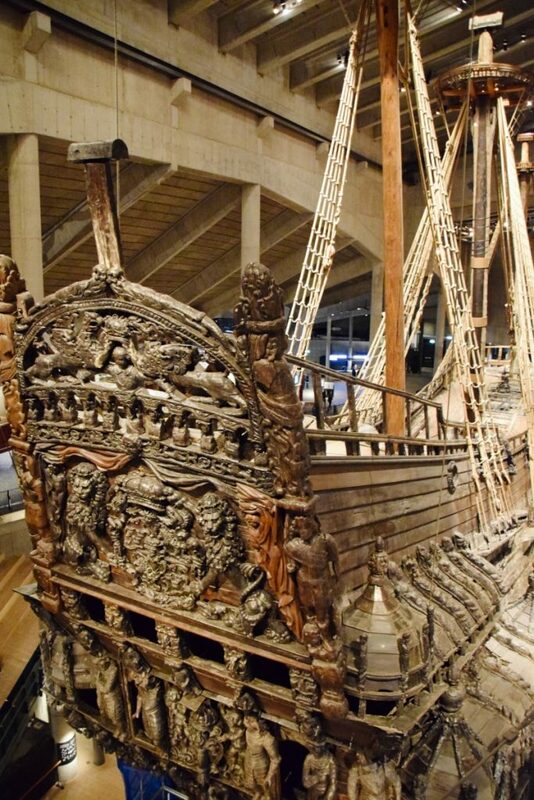 On Sunday, 10th of August, 1628, the Vasa prepared to sail for the first time. There was much rejoicing. The quay was packed full of people and the water was covered in little crafts carrying those who wanted to watch the launch of what was supposed to be the greatest war ship in the north. Because it was the ship’s maiden voyage, the crew had brought their families on board – these women and children would disembark at Vaxholm, before the ship sailed to the base on the island of Älvsnabben in the Stockholm archipelago. From there, it would await further orders. 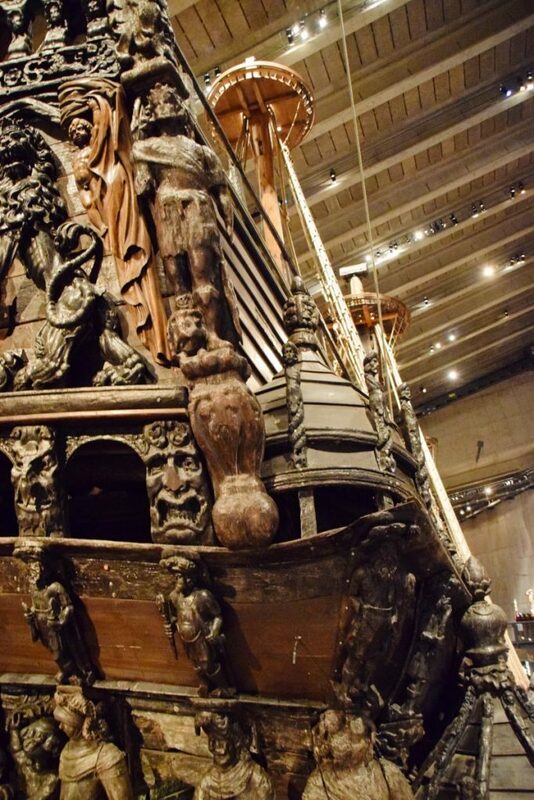 The Vasa cast off between four and five o’clock, after various delays. The wind was unfavourable, so it was towed by cables along the shore to a place called Slussen, where the ship could pick up a current that would take her down to the harbour. 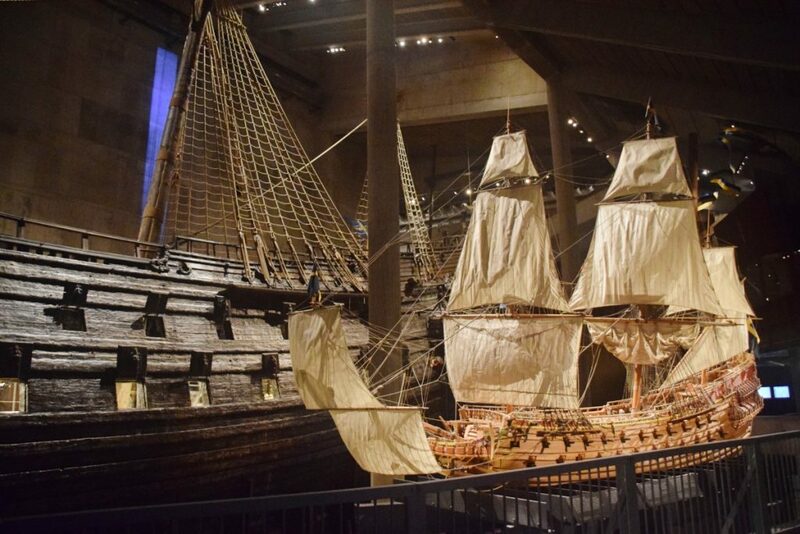 Once the current was found, the Vasa was freed from the land, four sails were set and a salute was fired. But there was no wind for the sails. 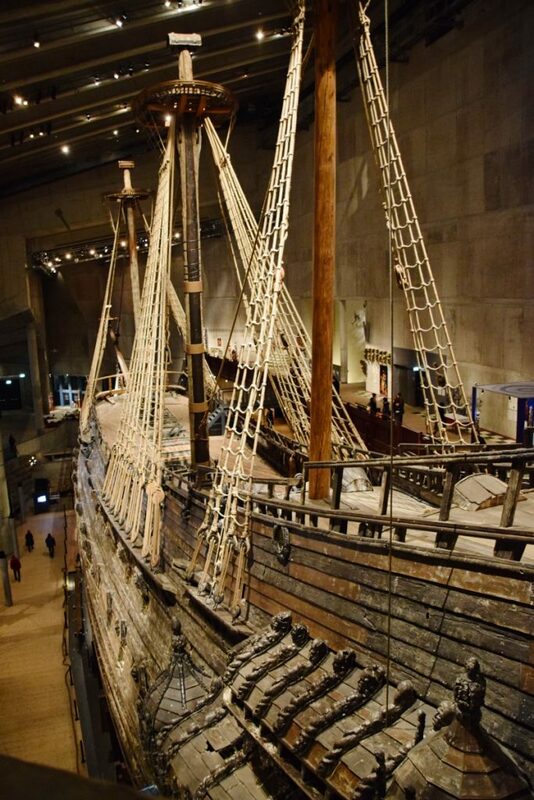 The Vasa drifted on the current, and when small gusts of wind did finally fills the sails, the ship heeled. It recovered. The ship continued on towards a gap in the bluffs of Tegelviken. A much stronger gust suddenly filled the sails and pushed the ship so far over that water started pouring in through the open gunports on the lower gundeck. 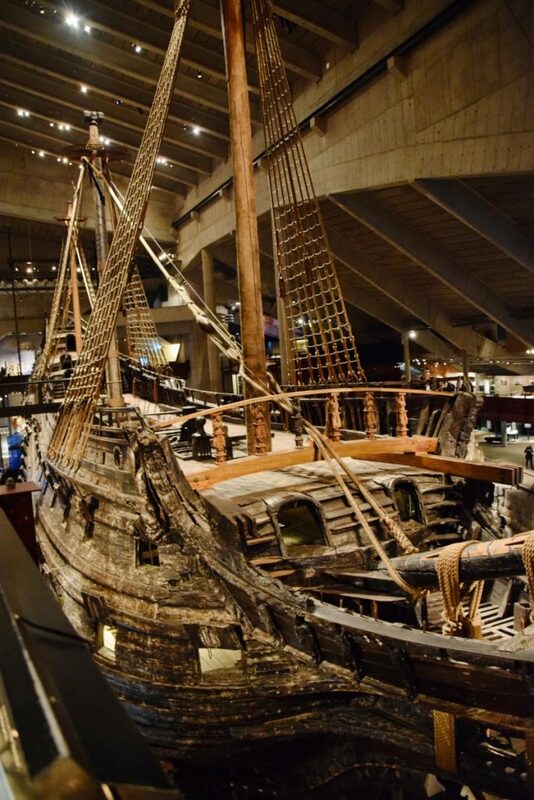 The Vasa began to sink. The captain, Söfring Hansson, ordered the gun ports closed and the sails were altered to empty them of the wind. The Vice Admiral, Erik Jönsson, ran below to ensure that the cannons hadn’t broken loose. The ship had already begun to go down – those able to reach the deck were throwing themselves into the water, while those trapped down below struggled up ladders, desperately climbing upwards. They had barely any time – within minutes the ship had sunk to a depth of 32 metres. Only the masts stuck above the water, a lifeline to those clinging to them. 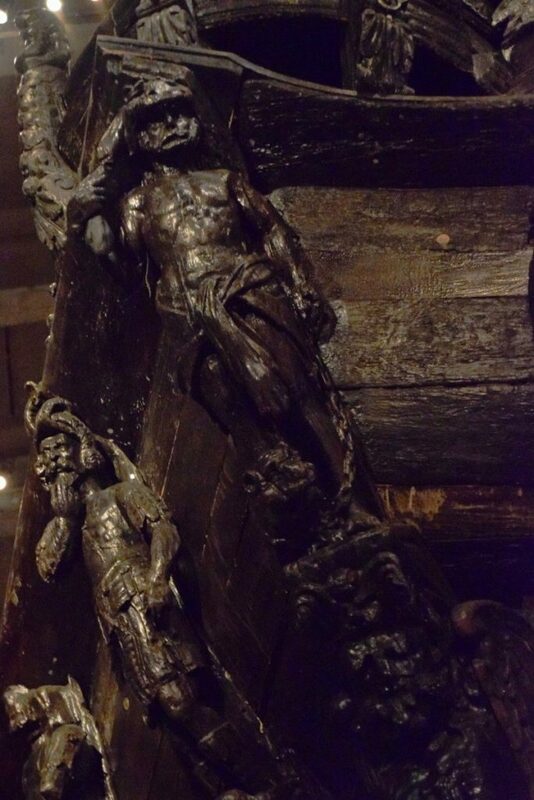 Thirty sailors and guests died on the Vasa. Many of them had been caught below decks and had been unable to reach the deck before the ship sank. 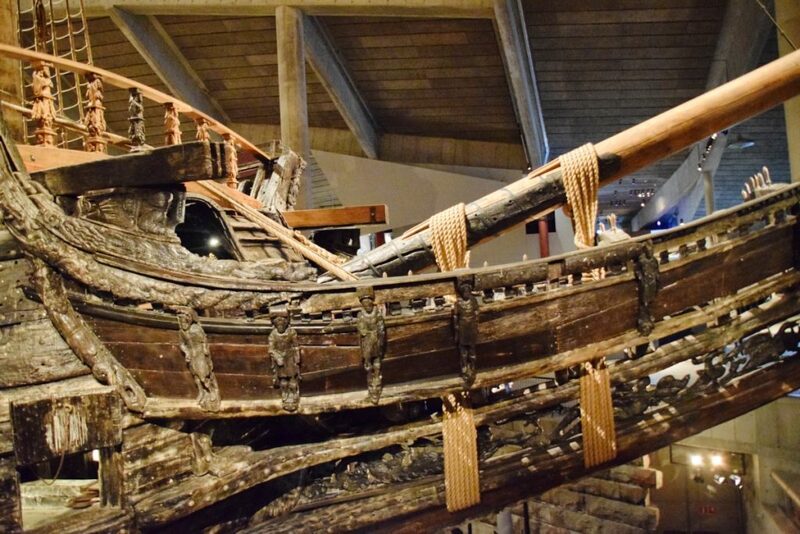 The survivors were either rescued by the small crafts that had been following the Vasa’s progress along the water, or swam to the shore. The Vice Admiral, Jönsson, was pulled from the water and miraculously survived, while the captain, Hansson, almost got dragged under by the sinking ship. The disaster had immediate consequences. Having a star ship sink after sailing barely a kilometre, in full view of Stockholm’s citizens and foreign agents, was not something that could be brushed under the carpet. The day after the disaster, the Council of State began investigating what had happened. The captain, Hansson, was imprisoned and interrogated by the Council. He swore that the crew were sober and the guns were properly lashed, explained the orders he’d given and stated that the ship had been unstable under sail. Luckily, the king was not in Stockholm when this happened. He was informed of the disaster, and was furious, but by then a special commission was formed to hold an inquest – chaired by Admiral of the Realm, Karl Karlsson Gyllenhielm – who was fortunately also the king’s older half-brother. The inquest started on the 5th September at the Tre Kronor palace in Stockholm. Unfortunately, parts of the transcript have been lost, but much of the day’s discussions are still known. Surviving officers and senior petty officers, from Vice Admiral Erik Jönsson to boatswain Per Bertilsson, were all called in and asked the same questions: whether they knew the ship was unsteady, and whether it was their fault that the ship had sunk. Everyone agreed that the ship’s flaws were unknown. And it certainly wasn’t their fault. The problem was, Fleming was under pressure to get the ship out to sea. Clearly with the King too far away to consult, and presumably hoping that problems could be discreetly and quickly fixed, Fleming made the decision to appoint Hansson as captain and to go ahead with getting her to the base in Älvsnabben. Interestingly, Fleming wasn’t ever questioned about the incident. So this line of questioning went nowhere. 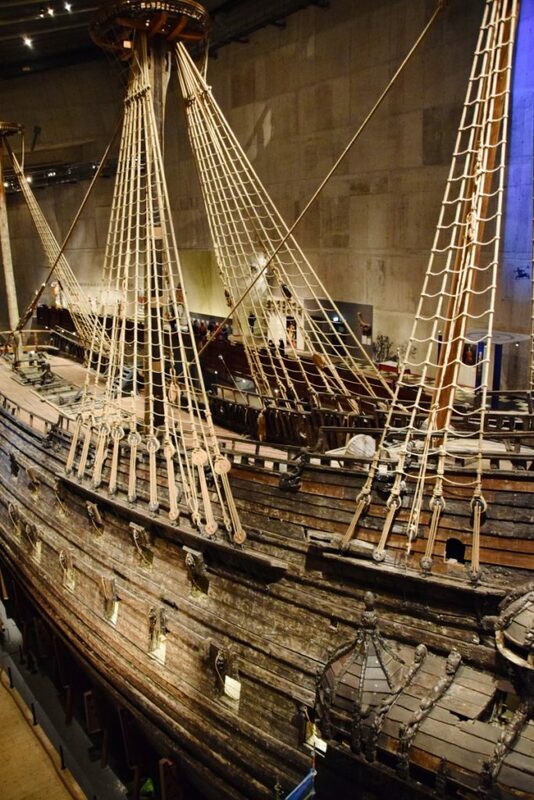 It emerged, during questioning, that most people agreed that the Vasa sank because it was badly designed. The owners of the shipyard were called in – first to be questioned was Hein Jacobsson, who had taken over as designer after the death of Henrik Hybertsson. With a dead scapegoat so conveniently at hand, Jacobsson said that the ship was built according to his predecessor’s design and that this design had been approved by the King himself. Jacobsson implied that the design of Hybertsson was flawed. Hybertsson’s partner, the merchant Arendt de Groote, was then questioned. 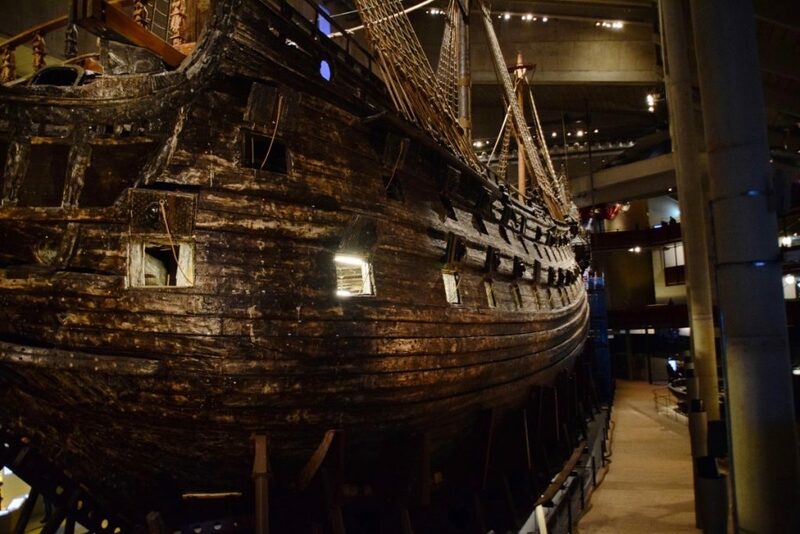 He backed up what Jacobsson had told the commission, and reiterated that the King had been shown a picture of a similar ship that had been used as a model for the Vasa. At this point, the commission had to carefully consider its path. They needed to blame someone – but they didn’t want to potentially remove someone who was important to the navy’s war effort. 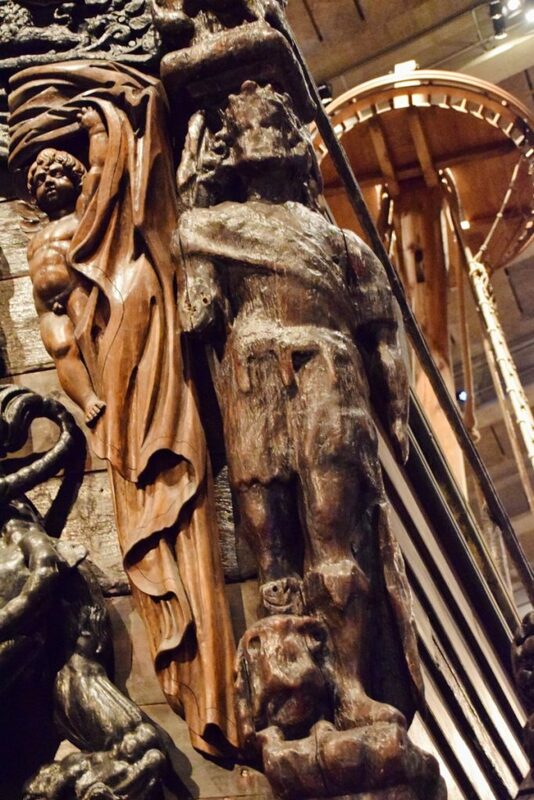 And the original designer Hybertsson was the easiest person to pin the Vasa’s defects on. That way, no one need be punished, everyone could move on, and the navy could concentrate on more pleasant things – like war. So in the end, no one was officially blamed. In fact, in the end, all those involved went on to have successful careers, and the whole incident was neatly laid to bed. 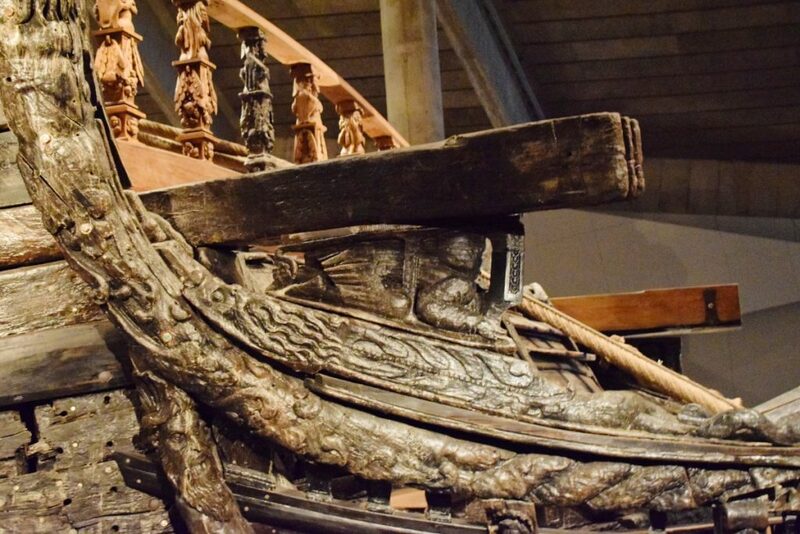 At the end of the inquest, a group of experts, captains and shipwrights were consulted to give their opinion as to what was wrong with the Vasa. They said it did not have enough ‘belly’ to carry the high and heavy upperworks. It had, indeed, been badly designed. 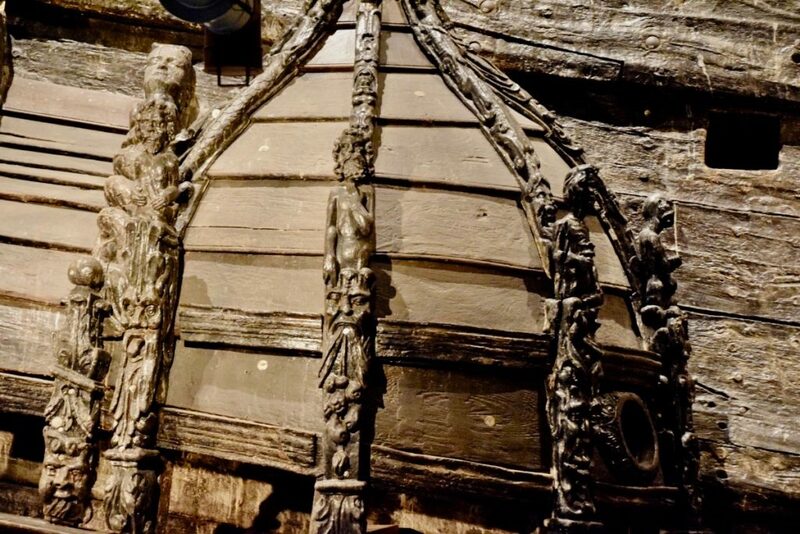 And yet – from an outsider’s perspective there are so many people who could easily be blamed for a series of mistakes that compounded the flaws of the Vasa’s original design. There’s Vice Admiral Fleming, who saw the ship’s inability to stay upright; there’s captain Hansson, who left the gun ports open; there’s Hybertsson’s successor, Jacobsson, who should have done something to correct some flaws he must have seen. I guess in the end you just have to forget about who made what mistake and just get on with it. 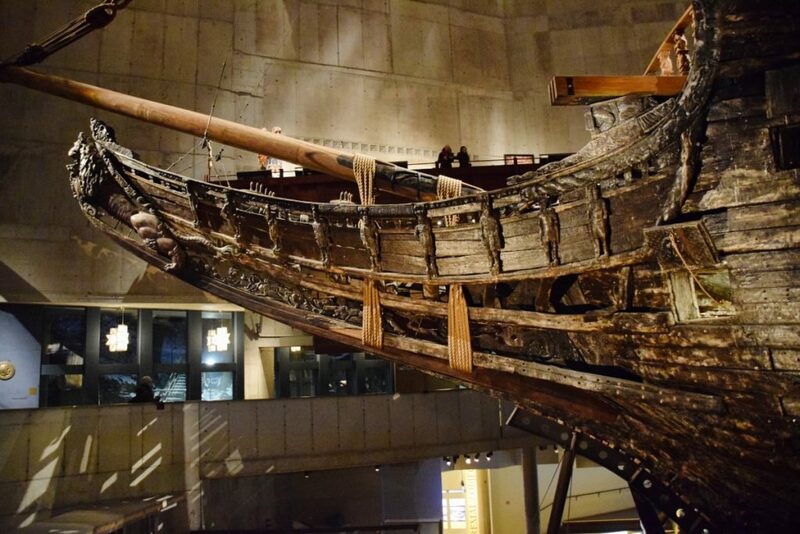 In fact, it shows the commission’s wisdom that, in an ultimately tragic situation – where steps could have been taken to avert the disaster but probably nothing could have been done to make the Vasa seaworthy – they let people off so lightly. The Swedish armed forces relied on unwilling conscripts. To be conscripted into the army was basically seen as a death sentence – they had bad provisions, weren’t well fed, spent all year in terrible camps and were likely to face the enemy in battle. Sailors, on the other hand, had good provisions, were fed more regularly, got to spend winter at home and were extremely unlikely to ever face the enemy. In the 1620s, over 4/5ths of the sailors were conscripts. Selected parishes were visited along the Swedish coast and every unfortunate 10th man was selected for naval service – so long as he was between the ages of 18 and 48. Those unfortunate 10th men with maritime experience of any kind were eligible from the ages of 15 and 65, which, I can’t help but think, means that a 65 year old Swede living along the coasts was expected to be in pretty good shape. the captain, under commission to the King. The crew lived in cramped conditions, though the officers lived in cabins, with more space and more facilities. There was also be a great cabin, which is where the king or admiral would stay if they came on board, and which would be kitted out in a manner to which they had become accustomed on land, with fine furniture and panelling and gorgeousness. Generally the conditions were hideously unsanitary. Disease was the biggest killer, since it was impossible to have decent levels of hygiene, with poor ventilation and little opportunity to wash. The overcrowding meant that they were a neat Petrie dish for the disease to spread in. 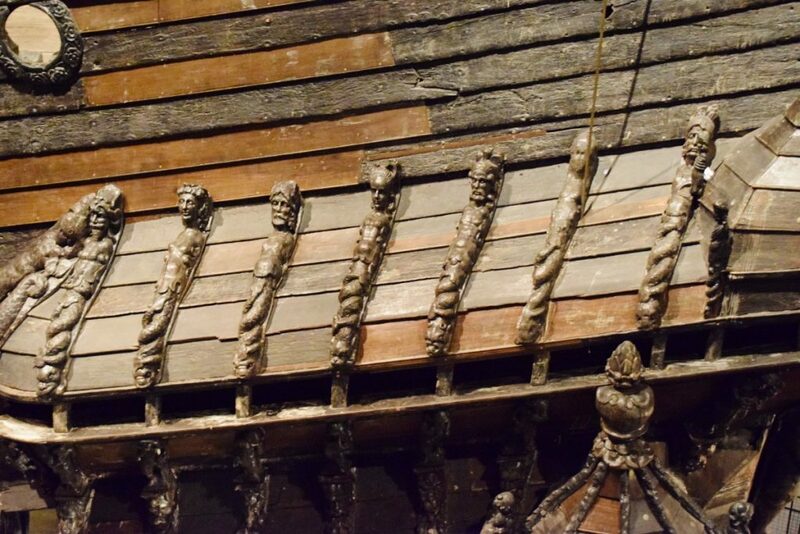 The barber acted as a doctor, and was good at amputating limbs and setting bones – more than half of the skeletons found on the Vasa were found to have healed, well-set, broken bones, and some even had healed amputations. The food that they ate was not exactly conducive to promoting good health either, but it was balanced-ish; the basic protein was salted meat, the carbs were dried peas and bread. 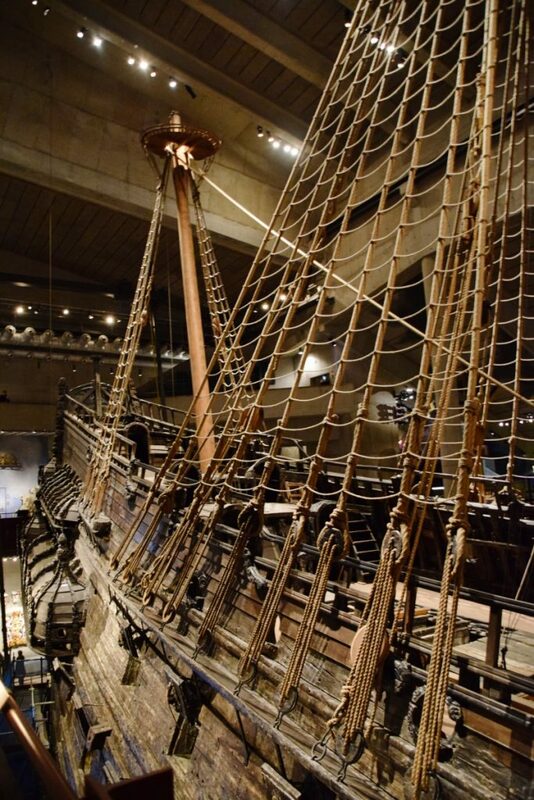 The Vasa’s hold was interesting, as it showed that they mainly ate beef, with a little pork and mutton, as well as some fish and poultry – skeletons of chickens were also found, so presumably there was a supply of eggs for those lucky enough to get them. Fishing equipment and weapons for hunting were also discovered, so the crew were presumably expected to supplement their stocks with fresh meats and fish. 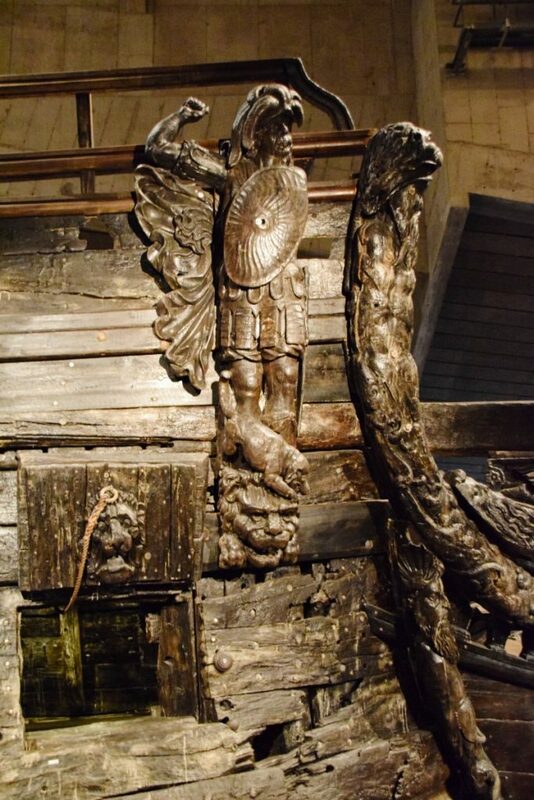 The location of the Vasa, at the bottom of the sea, was not a secret. In the 1660s, there was a diving project to recover the guns, and right up until the early 20th century the wreck it was explored by divers, but it wasn’t until the 1950s that a concerted effort was made to find it again. 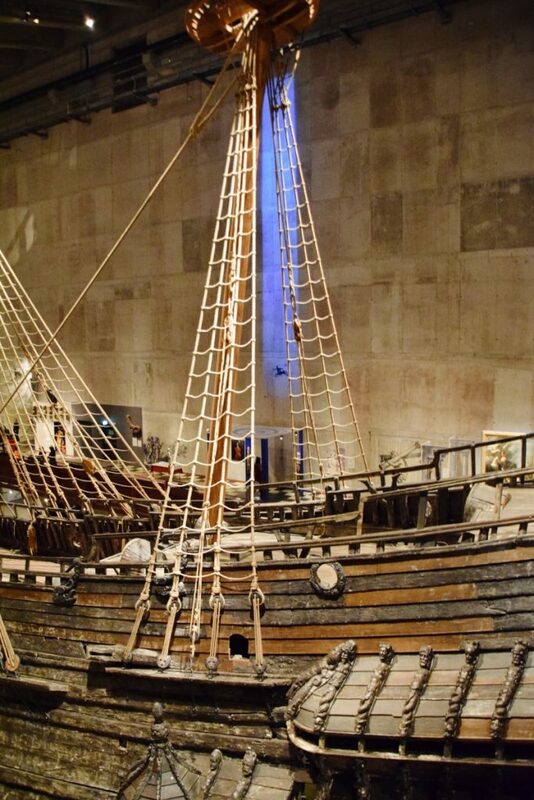 It was the pet project of Anders Franzén, a fuel engineer in the Swedish navy (and amateur archaeologist), to find the Vasa. He checked out archives and initially went out exploring in the wrong area, and found “rusty iron stoves and ladies’ bicycles, Christmas trees, dead cats and much else about which to keep silent”. Franzén consulted the archives again, and realised he was looking in the wrong place. The new location was actually a busy shipping lane, and Franzén’s work was made easier because the area had been charted that summer by the city of Stockholm, which was considering building a bridge in that area. The chart showed a lump at the bottom of the water near Beckholmen. Franzén met Per Edvin Fälting, the navy’s most experienced salvage diver, who had worked in the harbour and knew it well. In the summer of 1956, they went exploring together in this location with the lump, dragging a grapnel at the bottom of the waters. The grapnel was a simple device made up of little hooks which was dragged along by a rope and when it caught something, Franzén could lower his own invention, a gravity-powered coring device. This could cut out a sample of what the grapnel had caught on. On the 25th of August, the grapnel caught on something. The coring device brought up a piece of black oak. It was where the chart showed the lump. Franzén and Fälting moved along 20 metres and lowered the coring device. Again it came back with blackened wood. These pieces of wood were enough to show the navy and to persuade them that they should send out a diving team to investigate. A few weeks later, Fälting descended to the bottom of the sea and began walking forwards. He came across a vertical wooden wall with a row of square openings. He climbed up and found another row. 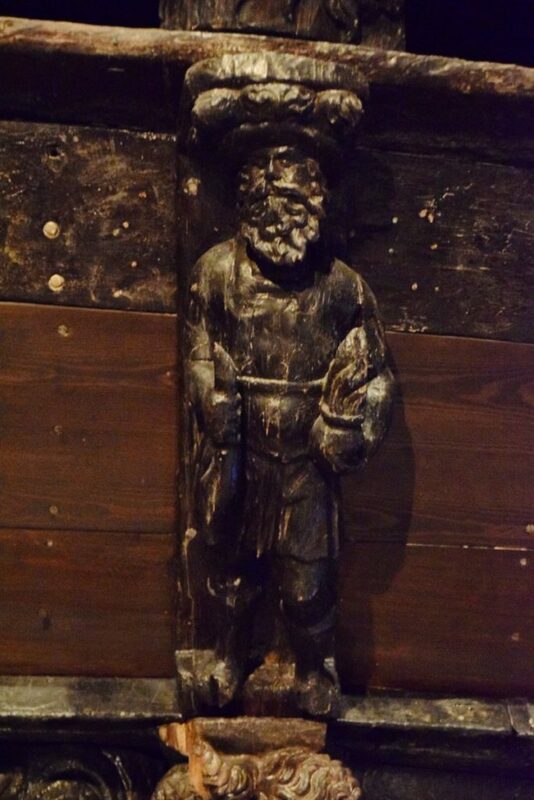 He was walking on the wreck of the Vasa. This began the next phase of the adventure – that was apparently called Sweden’s Apollo Programme. 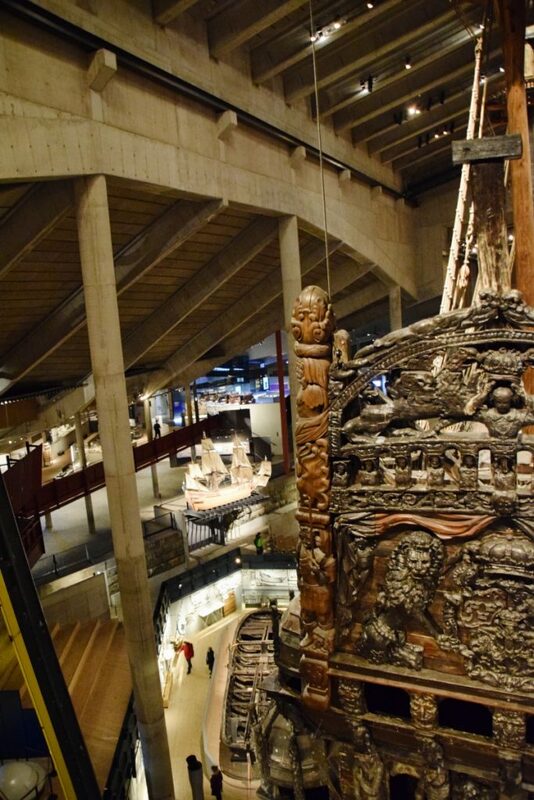 Franzén had the idea that the wreck should be lifted and placed in a museum, and it was his powers of persuasion that led to the vast project of raising and preserving the Vasa. He contacted institutions and technical experts, and managed to convince people to participate in the project. He even got the support of the king, Gustav VI Adolf – though perhaps this was not surprising considering his considerable interest in history and archaeology. His son, Prince Bertil, became the chairman of the Wasanämnden (the Vasa Board), which was involved in raising the ship. The problem was, no one really knew the best way to get the ship safely out of the sea. The issue became a hot topic, and creative suggestions flooded in – including the idea of freezing it in a gigantic ice-cube. Not sure why that was rejected, really. 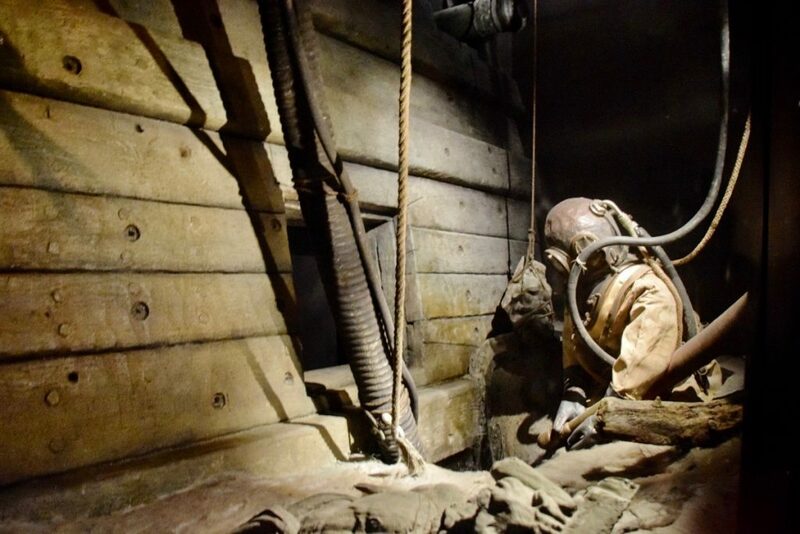 Anyway, from 1957 to 1959 divers found a gentle, but effective, way of lifting the Vasa out of the mud. Finally it was moved to waters about 17m deep, where a team fixed up the ship (replacing rusted bolts, rebuilding the bow and stern to make them watertight, etc) and most crucially, then cleared the decks of as much debris and mud as possible. 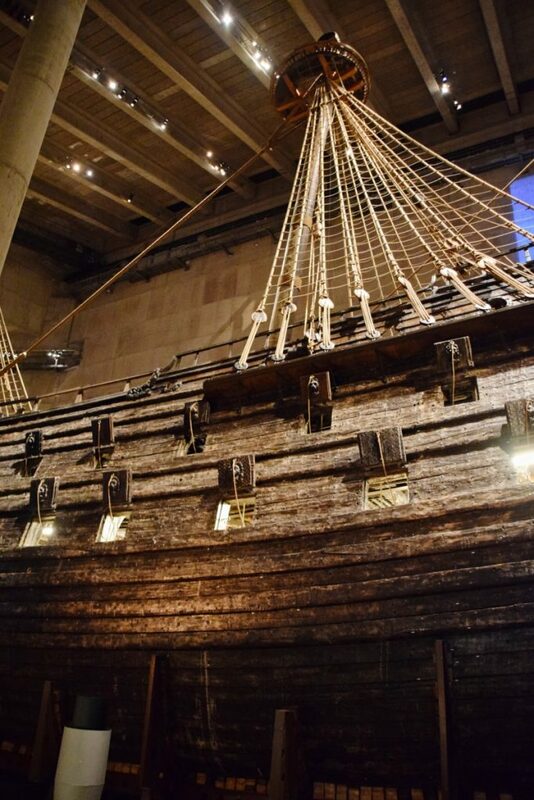 By the time the ship was ready to be raised, the whole of Sweden was glued to the news. 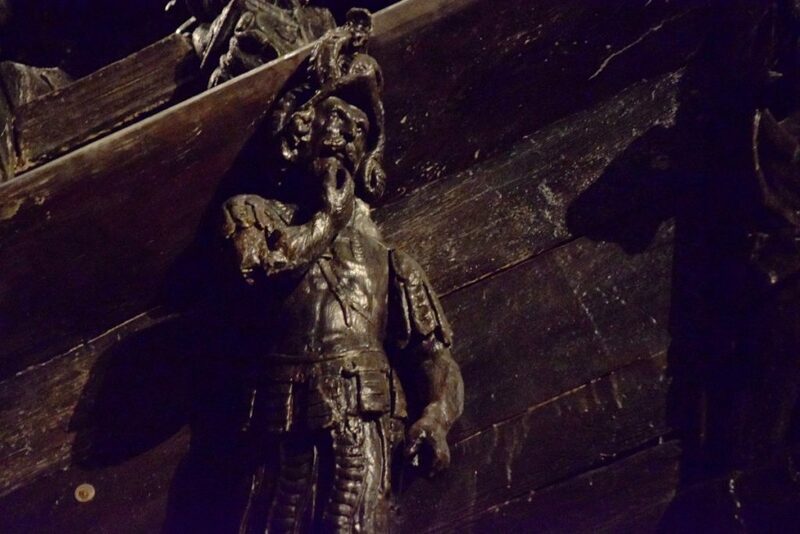 The Vasa had become a celebrity – the diver Fälting, a national hero. Crowds lined up to see the ship being lifted, and journalists covered the event for the radio, television and newspapers. Swedish Television broadcast the event live. 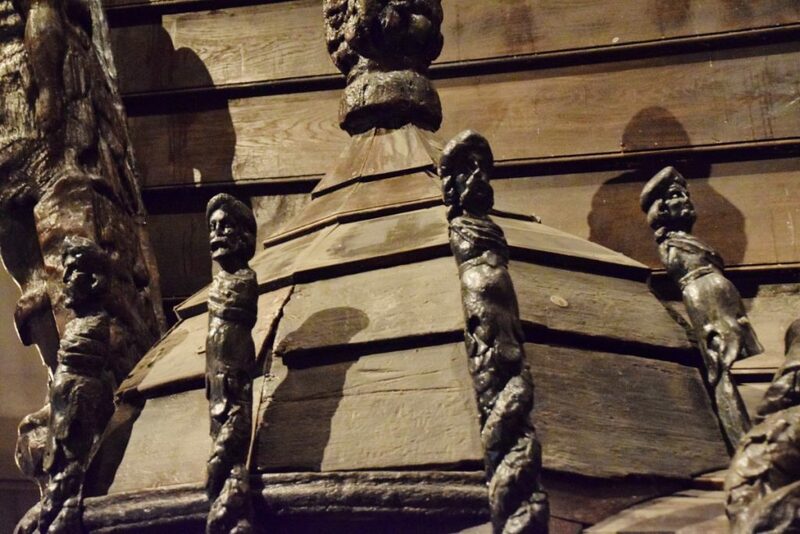 So there everyone was, on Monday the 14th of April 1961: at 9:03am the tops the ship became visible – then came the impressive carved heads of four warriors – then the whole ship was there for all to see. This was when the real work began. 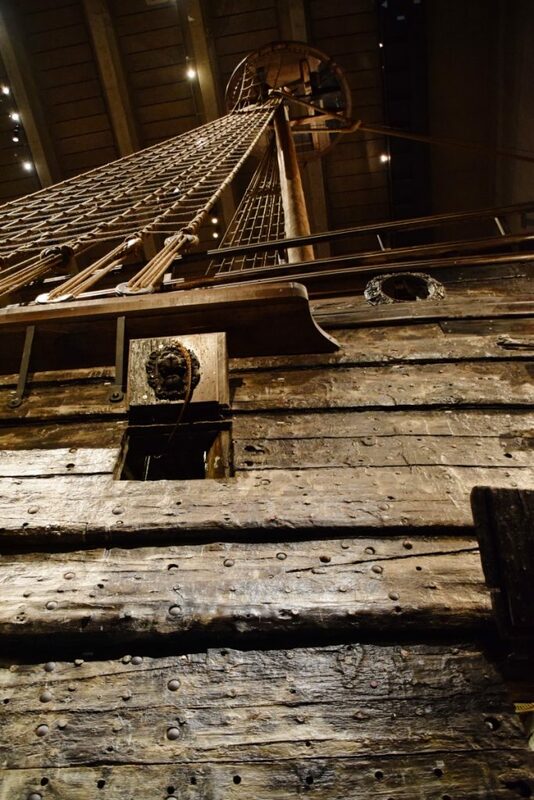 The Vasa needed to be completely cleared of mud and water, it needed to be conserved, and divers needed to pick up the remaining loose pieces that had stayed in the mud at the bottom of the water, the so-called ‘Pit’. 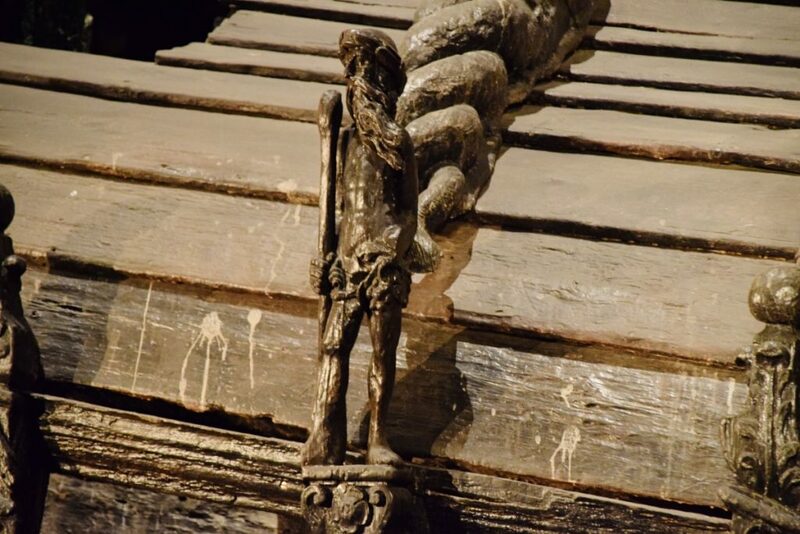 These careful and arduous tasks in the Vasa were completed by committed teams of people who needed to work as quickly as possible, as they didn’t know how long the ship could hold the weight of mud and all the objects that it contained. 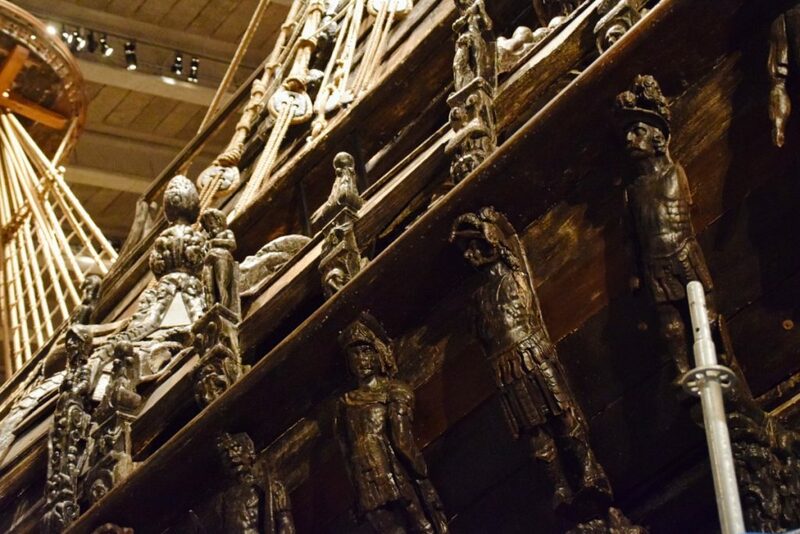 By the time the excavation was completed, over 40,000 objects were found and it was possible to put together the life of those on board the Vasa in great detail. The modern world was given a unique opportunity to see into a period of Swedish naval history that appeared to have been forever lost. 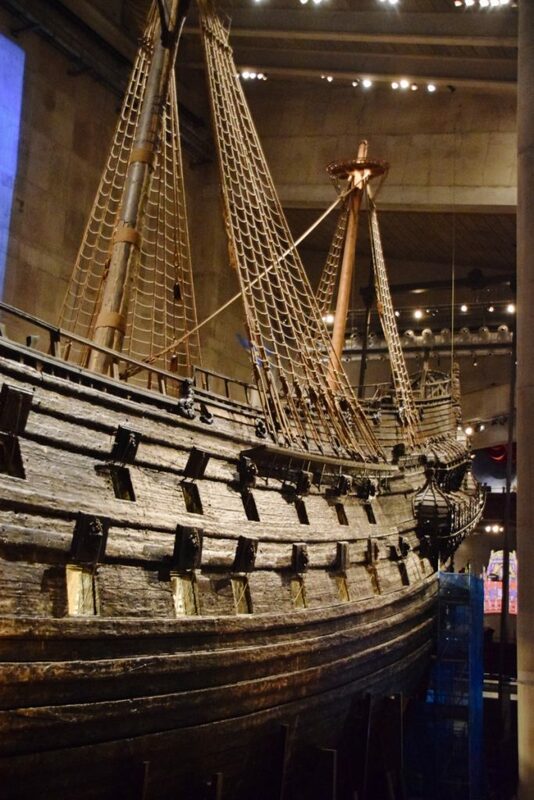 From 1961 until 1988, the Vasa lived in a temporary home. In 1981, a competition was held for architectural plans for a permanent Vasa Museum – the winners were Marianne Dahlbäck and Göran Månsson. Construction finally began in 1987, when Prince Bertil laid the foundation stone in a dry dock. 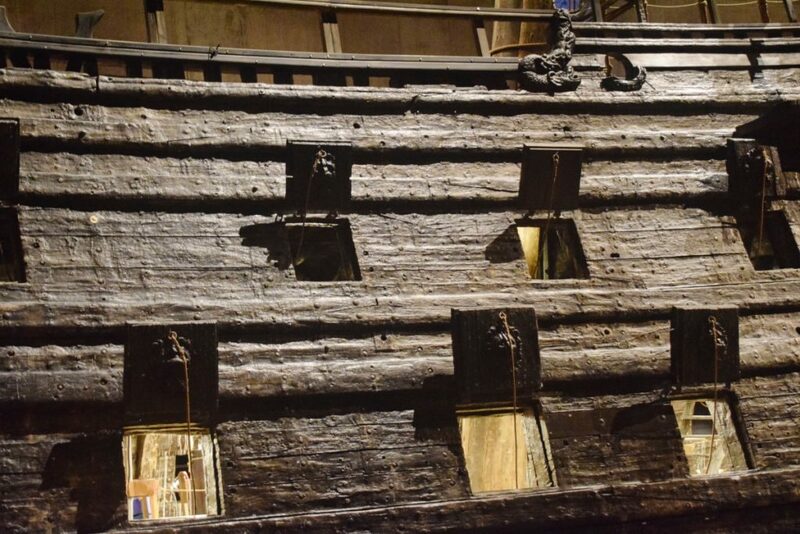 In 1988, the Vasa was put into a protective shell and placed on a pontoon, and sailed to her new home. King Carl XVI Gustaf inaugurated the museum in 1990. In 2013, the museum reopened after renovations – and a very nice job they’ve done too. And to think it was all made possible by captain Hansson, who didn’t close the gun ports. Thank you, Hansson. Thank you. 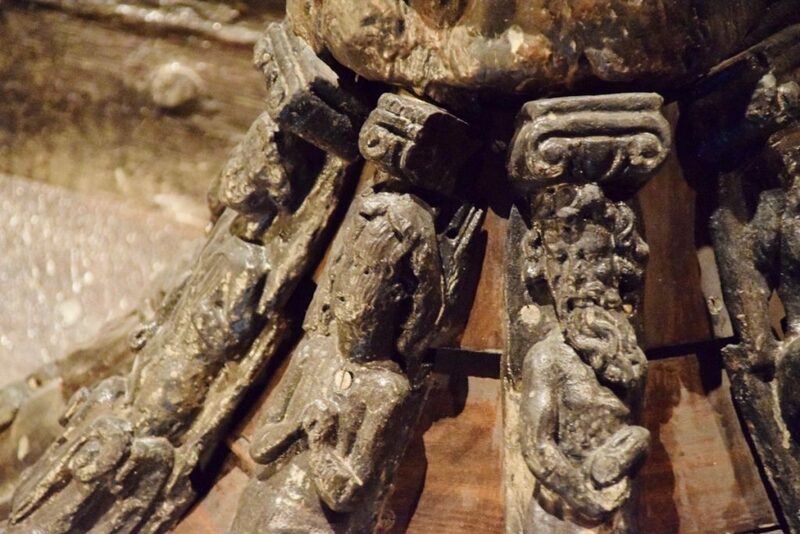 One of the most striking aspects of the Vasa is just how pretty it is – it is crawling with little and large wooden figures. The theme is pretty standard for the period – with imagery and symbolism taken from the classical world and to the taste of the Renaissance. As well as Greek and Roman motifs, there are figures from the Old Testament, Egypt and the realm of fantasy, with mermaids, wild men and sea monsters. Six distinct styles have been identified in the sculptures, and even my not very good photos below show that the works range from the elegant and sophisticated to the… just qualified. But there are some very fine works, which were sometimes hard to see, but which looked fascinating, if not always attractive. Since the sculptures made up much of the cost of building the ship, it seems pretty clear that the shipbuilders believed in the power of these images. 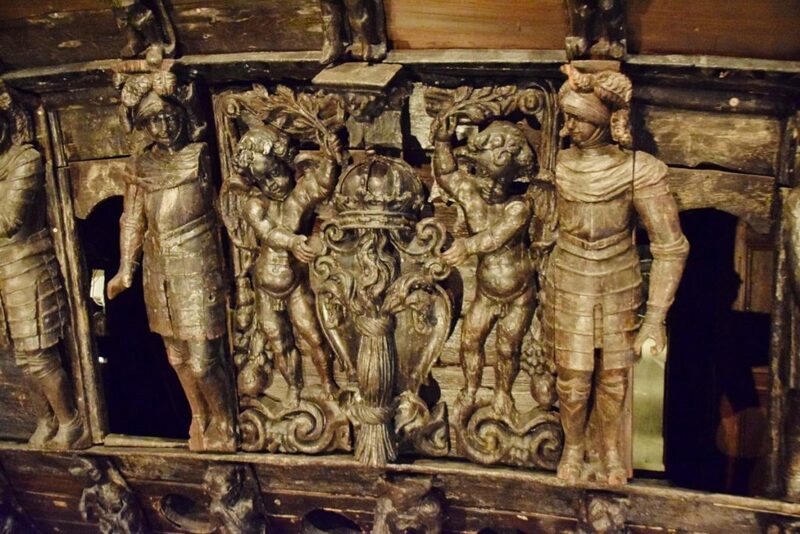 The ship’s decoration not only glorified the king and the navy, but it was also supposed to intimidate the enemy. 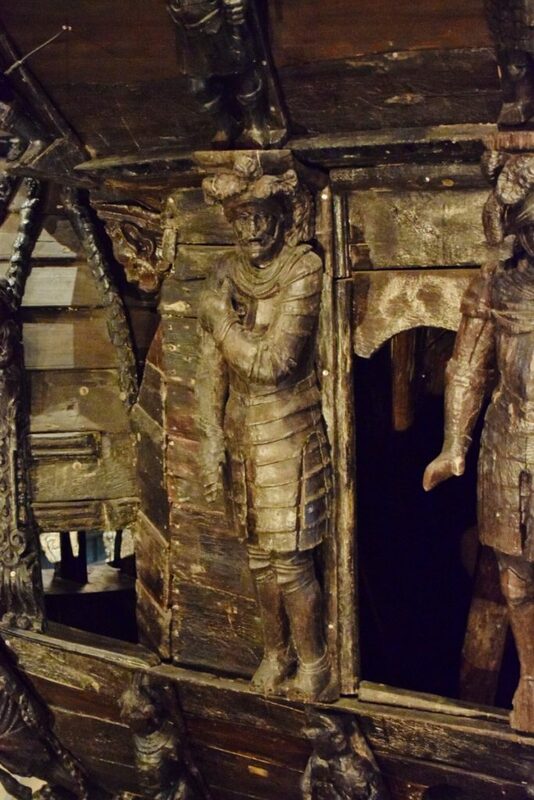 There are residues of paint on some sculptures, so the whole ship was thought to have been painted in bold colours, and with some gold leaf. I find it hard to believe this would have scared the enemy more than all the cannons. Both sides of the beakhead had 20 figures (of which 19 were found) depicting Roman emperors from Tiberius to Septimius Severus. There was no statue of Augustus – who would more naturally start the sequence because he was the first emperor of Rome – because King Gustav II Adolf was the new Augustus. 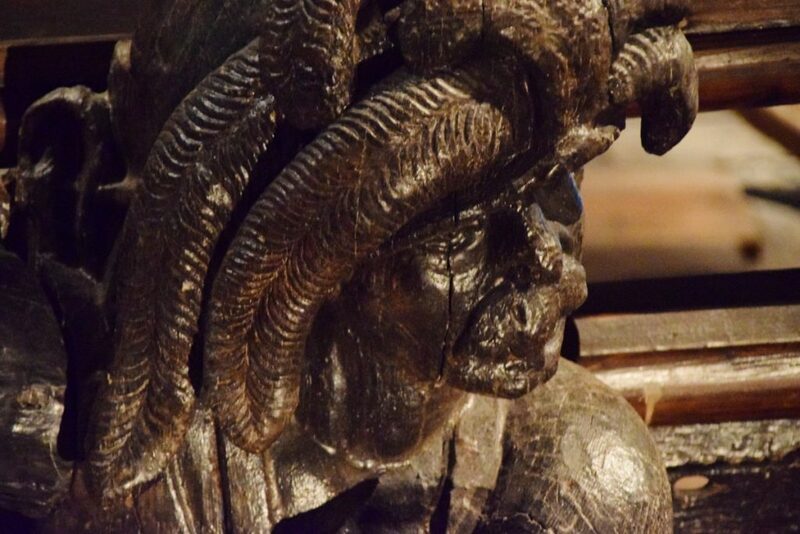 Detail of a Polish man hiding under a table, Vasa Museum, Stockholm, Sweden. This strange scene (replicated on the other side) is intended to humiliate the Poles – Sweden’s great enemies – and refers to a form of punishment in Poland at the time. The name board, Vasa Museum, Stockholm, Sweden. The two cherubs are holding a sheaf, which is a corruption of the original fasces heraldic symbol used by the Vasa Family. This is the ship’s name board, and therefore shows the ship’s name as being Vasa. 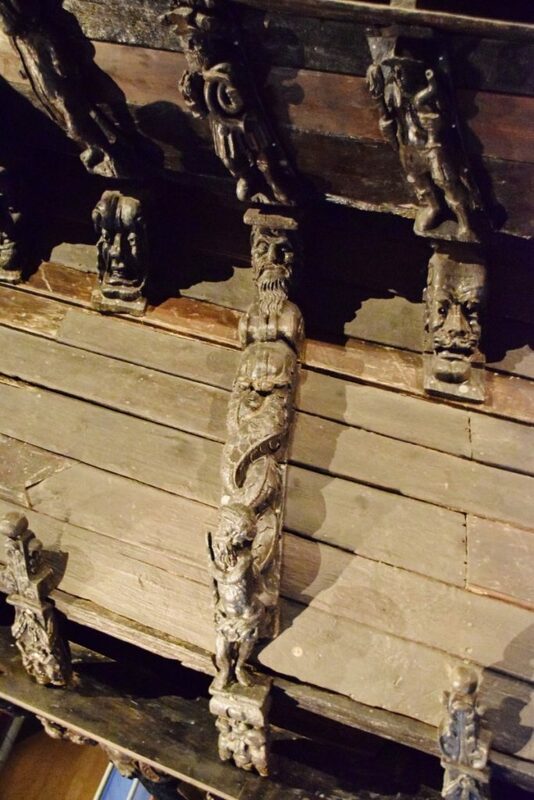 For me, the prospect of visiting the Vasa was one of the draws of going to Stockholm. 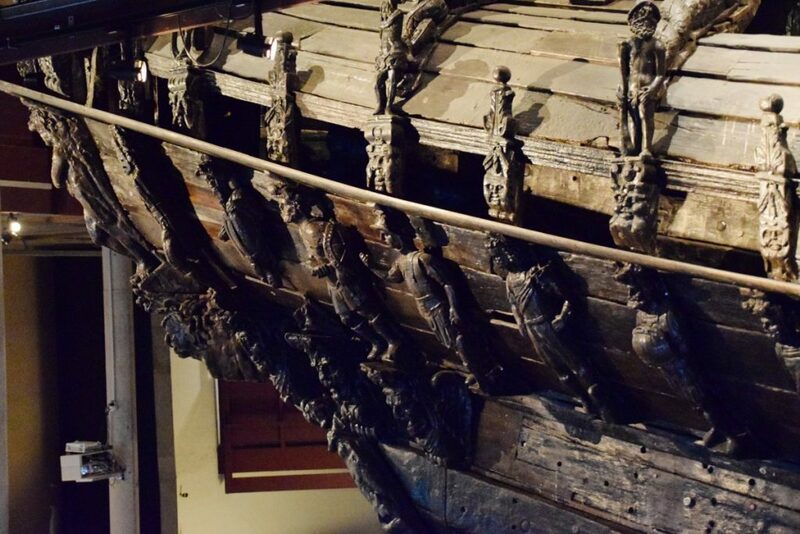 I love old ships, and it’s really quite extraordinary to look at this magnificent example of 17th century craftsmanship, looking at it from different perspectives. The lavish decorative elements were a real surprise and it was a shame we couldn’t get to see some of these sculpted figures from a little closer, though I guess for preservation reasons it wouldn’t be sensible to let us too close. It would have been nice to have more of the finds on display, to put the ship a bit more into its social context. But apart from that, what’s there not to love? 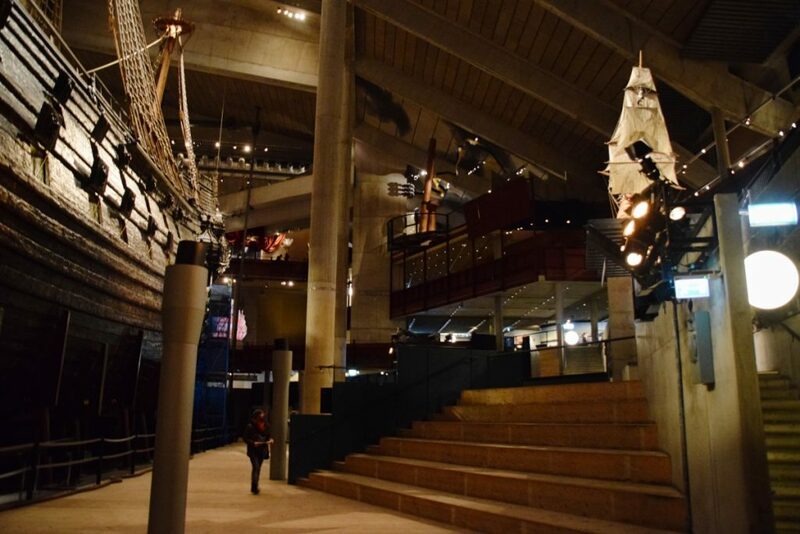 The museum is child friendly – young visitors can do something where they can set sail in a digital/real activity, presumably with more success than those in 1628. Here’s something else which will last longer than the Vasa: you can get a Revell kit of the ship which will take less time to build, and will see an equal amount of time in naval service. There was also a neat gift shop, which I had to rush through as we were being kicked out at closing. The museum is the most popular in Sweden, and therefore gets lots of visitors – though I must say that a December afternoon might be the time to visit, because the crowds weren’t bad at all.